Choice blindness refers to ways in which people are blind to their own choices and preferences. Lars Hall and Peter Johansson further explain this phenomenon in their study. Choice Blindness is type of a broader phenomenon called the introspection illusion. Here, people wrongly think they have direct insight into the origins of their mental states, while treating other’s introspections as unreliable. Let’s look at choice blindness this way. We think we want A but when we are given B, we make up all kinds of reasons that would persuade us into believing that B is a much better alternative and how we actually wanted it all along. Lars Hall and Peter Johansson further explain choice blindness in their study. Peter Johansson together with his colleagues collectively investigated subjects’ insight into their own preferences using a new technique. The researchers’ aim was to measure whether participants notice that something went wrong with their choice, during and after the experimental task. 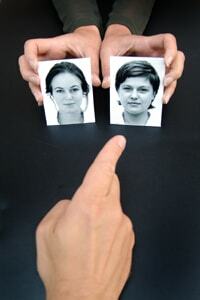 The experimenters presented subjects two photos of female faces and were asked which they found more attractive. They were given a closer look at their "chosen" photograph and asked to verbally explain their choice immediately. The trial was repeated 15 times for watch volunteer, using different pairs of faces but in three of the trials, unknown to the subjects, a card magic trick was used to extremely exchange one face for the other after a decision has been made. The subjects end up with the face they did not actually choose. And they were again, asked to explain why made them choose that particular face, even though it wasn’t really their first choice. Majority of the participants failed to actually notice that the picture they were looking at wasn’t their original choice. Many subjects confabulated explanations of their choice. I preferred this one because I prefer blondes. when he in fact his original choice was the brunette, but he was handed a blonde. These must have been confabulated because they explain a preference that they did not really make to begin with. Common sense would tell that all of us would of course notice such a big change in the outcome of a choice. But results showed that in 75% of the trials, the participants were blind to the mismatch. What’s more interesting is that, not only were a large number of participants were clueless of the switch, when allowed to take a longer look at their choice, they were able to make up a detailed explanation for why they chose that face when originally, they actually rejected it. The experimenters coined the term choice blindness for this failure to detect a mismatch. A few, less than 1/10 of the manipulations were easily spotted by the participants. Not more than 20% of all manipulations were actually exposed, towards the end of each experiment. Suppose you were involved in an experiment where the faces you chose were switched. Would you notice? 84% of the participants said in the post-test interview that they would. Researchers called this choice blindness. When the truth was revealed to some, they expressed surprise and even disbelief. Johansson further explains that when individuals were asked to reason out their choices, they remained confident in their verbal reports and had the same state of emotionality and expressed the same level of detail for faces they have and have not chosen. Another important finding is that the effects of choice blindness go beyond snap judgements. Depending on what the participants say in response to the mismatched outcomes of choices (whether they give short or long explanations, give numerical rating or labelling, and so on), it was found that this interaction could change their future preferences to the extent that they come to prefer the previously rejected alternative. This gave the researchers a rare glimpse into the complicated dynamics of self-feedback ("I chose this, I publicly said so, therefore I must like it"), which is suspect as to what lies behind the formation of many everyday preferences. The researchers did not know how or why choice blindness occur but they think it gets to the very heart of how we make decisions in our everyday life. According to Hall, one of the researchers, choice blindness doesn’t always happen. Therefore the concept of intention needs to be re-evaluated and investigated more closely. There are several theories about decision-making that assume that we recognize when our intentions and the outcome of our choices do not match up but Johansson’s study shows that this assumption is not always the case. His experiment challenges both current theories of decision-making and common sense notions of choice and self-knowledge. Experiments on choice blindness can be used to provide a way to study subjectivity and introspection, topics once considered by scientists to be extremely difficult or even impossible to measure or evaluate scientifically.